When many people think of Long Island, they usually think about the many beaches and parks, but there are many other things to do. For example, there are gorgeous botanical gardens and arboretums all over Nassau and Suffolk County. Generally, botanical gardens are created for the public to enjoy collections of plants, as well as being a research facility for botanist, people who studying the biology and science of plant life. While arboretums are a collections of trees. We may be on Long Island, but botanical gardens lets us enjoy plants from other parts of the country and even from other parts of the world. Each botanical garden offers a different experience for their guests. Check one out and enjoy the beautiful plant life and maybe you will learn something new about plant life on Long Island and around the world. In this 40-acres of woods, ponds, and garden offers beautiful trails where you can learn about the history of Long Island and ecology. In addition, the arboretum offers workshops, plant sales, special events, and opportunities for volunteering. Want your children to have a hands-on experience with nature? The arboretum offers a children’s habitat from them to explore, climb, build, and create in nature. Admission is free, and guests are welcome to picnic and walk their dogs. The former estate of William Robertson Coe and Mai Rogers Coe, this 409 acres is a historic building that has huge lawns, formal gardens, hiking trails and many plant specimens. In addition to the beautiful grounds, the building still contains many original pieces of furniture. Guided and self-guided tours are offered daily for different portions of the property. Educational programs are available as well. This botanical garden is not only a living museum, but also a educational facility. They have collections of wildflowers, roses, daylilies, wetland plants, rock garden plants, herbs, medicinal plants, among their dozens of collection of particular plan families. The botanical garden hosts many events and educational programs. Who knew that as you get a fine education, you can enjoy an arboretum at the same time! Their arboretum offers beautiful flowers and over 12,000 evergreens in almost 625 species and varieties. 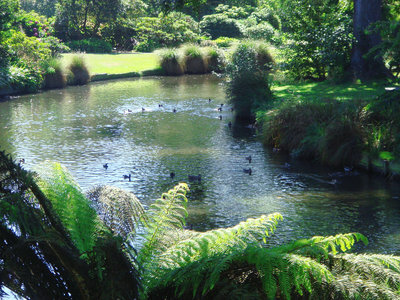 Two-acres of their arboretum is a dedicated bird sanctuary. Yet another university that not only is it a fantastic university, LIU Post also has a community arboretum on its campus. Best known for their Great Lawn, LIU Post gives free admission to anyone wanting to view their arboretum. Group tours are available by appointment. So enjoy the 105-foot tulip tree and 91-year-old American Elm. Nationally registered as a historic place, this botanical garden’s goal is to “inspire appreciation and knowledge of the best qualities exemplified in the American country estate of the early 20th century.” Hosting many events and educational programs, Old Westbury Garden provides a lot of educational opportunities in the areas of earth science, physics, and history. Donated to the Long Island State Park Region, Baynard Cutting Arboretum was originally a large wooded area with large oaks. Now it contains evergreens, rhododendron, azaleas, and hollies. In addition, there are wildflowers and daffodils. The arboretum has many trails to walk, public buildings, and restrooms. This arboretum is close to Heckscher State Park. Bridge Gardens offers many different gardens on this grounds. In addition, they have many educational and family programs. The gardens are available for private events. Tours are available. The facility has many species of trees, hedgerow, flowers, and herbs. LongHouse Reserve has many focuses they want their guests to experience. They takes pride in their “Art in the Gardens,” an exhibition of sculptures at their facilities. They offer many educational resources for schools and families. Their garden is focused on studying the planting potential in the climates of Long Island. This conservancy is a registered historic site established by Robert Dash. The conservancy offers many events as well as classes. Classes range from learning about plants to painting. Madoo is also available for private events like weddings. Muttontown Preserve is Nassau County’s largest nature preserve. It is home to many nature trails, wildflowers, trees, birds, mammals, reptiles and amphibians. At one time in our American history, many Americans were fascinated with the Japanese aesthetics in the 1960. This Japanese gardens feature many Japanese flowers and plants as to teach their guests about Japanese culture. The Farmingdale State College Department of Urban Horticulture & Design has maintained a series of themed gardens since the 1930s. The over four-acre area contains annual beds, a rose garden, a beech hedge garden, a tropical garden, a perennial garden, and other segments dedicated to specific forms of plant life. This 11-acre park and preserve provides a lovely nature trail and brick walkway by a pond. If you know a great botanical garden or arboretum on Long Island, let us know!